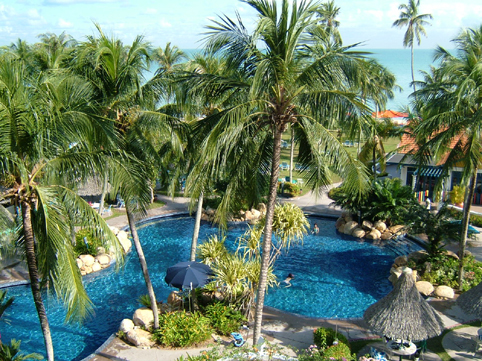 De Golden Sands Hotel is an excellent family resort in Batu Ferringhi. 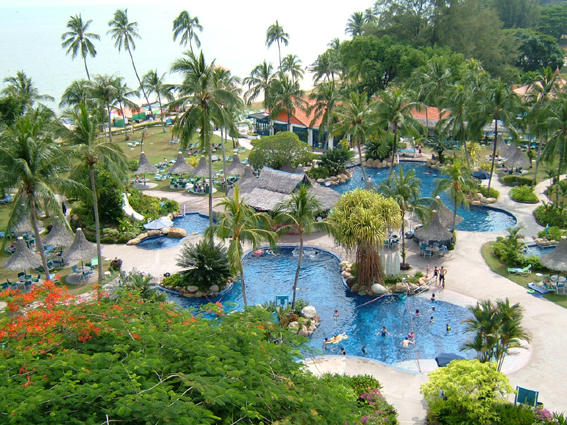 The resort has rooms with seaview and hillview. Be aware, when you make a booking for a room with hillview, that you will awaken by the sound for a prayer of the mosque, which is very close to the resort. This little mosque lies between the road and the resort. It's hardly to find, but if you take the trouble you'll fins also a little graveyard near the mosque. The hotel has several swimming pool filled with lovely water. The government takes regularly samples of the swimming water. The buffet breakfast is very large with many items and mostly included. The rooms have a refrigerator, balcony, safe deposit, coffee and tea making facilities, hairdryer, tv etc. Opposite the hotel is the mini-supermarket of Lee. Here you can buy almost everything from your mineral water till your whisky. If you buy a bottle of whisky, please be careful, because Malaysian whisky is flavoured with caramel. You better by a bottle of Scotch and they have. Beside the mini supermarket van Lee is the hawker centre "Global Bay" situated. The hawker centre is favourite by the locals and those who visit Batu Ferringhi more than once. There's another hawker centre called "Long Beach". Here you find a lot of tourists. When you're leaving the Golden Sand behind turn right. After some 100 meters you'll find "Long Beach" at your right. In the "Global Bay" you'll find one of the best tailors from Penang, called Parmanands. 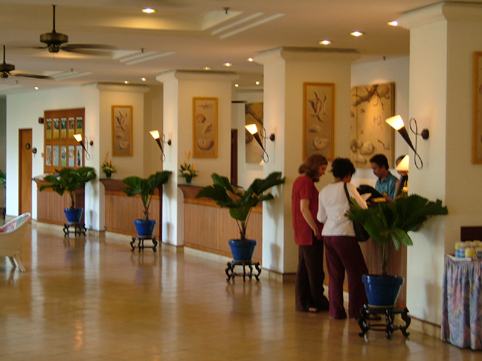 There are also shops of Parmanands in the Mutiara Hotel and opposite the Holiday Inn. There are also several souvenir shops in the "Global Bay". Favourite hawker stall: "Hong Kong Dim Sum". Beside the Golden Sands is a narrow little street, where you find a tailor, restaurants and souvenir shops. The restaurants are favourite for lunch. Don't have dinner there, because it's too quiet. In this little street, at the beachfront, is a restaurant where they have lovely nasi and drinks (also beer) for a reasonable price. When you further along the beach you'll see a blue house at your left hand "The Bungalow". This restaurant has delicious lamb chops. Beside "The Bungalow" is the oldest hotel of Batu Ferringhi, called "The Lone Pine". It's hidden between the pine trees. In the evening you can have dinner at the Garden Caf�, but it's much nicer to go to Peppino (Italian) or to Sigi's by the Sea. Here you can have western food. Apart from that, you'll can eat western everywhere in Batu Ferringhi and if you like there's also the food restaurant of KFC (Kentucky Fried Chicken). Tip: don't eat inside the hotel. Eat outside! At Shangri-La's Golden Sands Resort, you can choose from a wide range of activities within the lush tropical gardens facing the sea and sandy beach. Daily organized activities like jungle walks, village experiences, cooking classes, and much more. The jungle walk is every Monday, Wednesday and Saturday at 7:40 am. Participants will be taken on a walk to the National Park in Teluk Bahang. The snake show is every Saturday at 3 pm. It's a show of tropical snakes such as the King Cobra. There are also house tours and cocktail demonstrations. 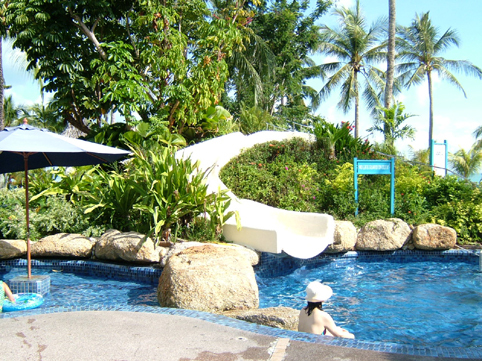 There are two sites in the Golden Sands where you can enjoy the "Happy Hour". The first one is between the swimming pools. The bar is called "Kuda Laut" and you can also have a delicious lunch over here. The "Happy Hour" is from 17.00 - 19.00 hours. 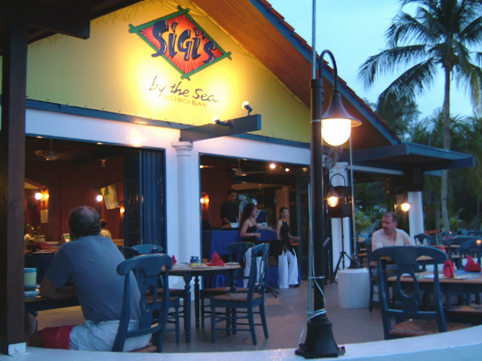 The second site, where you can enjoy "Happy Hour" is at "Sigi's by the Sea". Here's the "Happy Hour" from 17.00 uur till 20.00 hours. At 18.00 there's a music group from the Philippines. Probably the "Happy Hour" takes longer here to attract people for dinner. Foo and Family for the best massage. family business (father, sun, brother-in-law) and special "the old Foo" is doing a great job. We did experience this more than 16 years and if you mention my name you will know more about me! A "full massage" will cost RM60,- and you feel like reborn again. Tip: the other refexologists don't have much experience. You'd better go to Foo.